‘State of Siege’ is extended to the whole of Netherlands. Luftwaffe sends 712 bombers to London, 449 killed, including 34 firemen, the largest single loss of firefighters in British history. 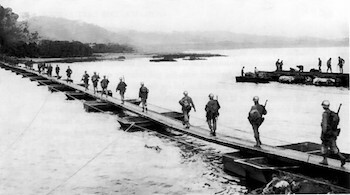 Resistance on Cebu Island ends as the US-Filipino garrison surrenders to the Japanese. During World War II, tens of thousands of Jews living in the Warsaw Ghetto began a valiant but futile battle against Nazi forces. The British Second Army reaches the Elbe and launches an attack on Bremen. The U.S. First Army captures Leipzig and Halle, 50 miles South of Magdeburg. On the eve of Hitler’s 56th birthday, Dr. Goebbels exhorts the nation and predicts that in spite of all misfortunes Germany will yet prevail, that the “perverse coalition between Bolshevism and Plutocracy” is about to break up, and that it is Adolf Hitler (“Our Hitler!”) who will still turn back the tide and save Europe, as he has thus far, from falling into the clutches of the Kremlin.